Centuries ago in your planet, an embodied being of maximum Light, as it was said previously, lived certain circumstances. Why have we created spirits in a non perfect way so that they could evolve in this way? So that when evolving they emit an energy of growth which goes elevating an octave the tonality of the Universe, and in this way each Big Bang will create a Universe an octave higher. This is a parable, but we know that many things are chance, but also nothingness is chance... Everything was already written and nothing is written. In the highest of vibrations, Nothingness and everything join, because the highest element of persistence it is nothingness. The emptiness of nothingness is on step above of everything. This doesn't mean that nothingness is above the Absolute because if the Absolute had ego, the ego of the Absolute would be nothingness, the total lack, the infinity of not being. A long time ago of your centuries an embodied being of Light was going along with his disciple. They were traveling alone, because other beings that surrounded them had been with their families. In fact, they were not in mission, although the trip was projected as a mission. They had arrived to a village, they were thirsty. That being of Light was 34 years old, and his disciple, who was accompanying him, was 17 years old. John Zebedee: Master, we have finally arrived to the village. Let’s go to the center, I know that there is a very big well wherein we can satiate our thirst. Master Jesus: My child that thirst is easy to satiate, you drink a couple of cups and you already satiate your thirst... But what about the other one? What about the other thirst? I want that you satisfy that thirst. Master Jesus: You are right my child, sometimes it is like I only live to teach you...You know that I love you. Master Jesus: I say that permanently, my child... look! we arrived already, we have water here... A young girl is approaching... What is your name young lady? Miriam: My name is Miriam, and by your face and through your eyes I see that you are a Master. Miriam: Can you see my interior, Master? Master Jesus: Maybe I’m not only seeing your interior... Maybe I am seeing your exterior... Have you said that your name is Miriam? Master Jesus: Where is your family? 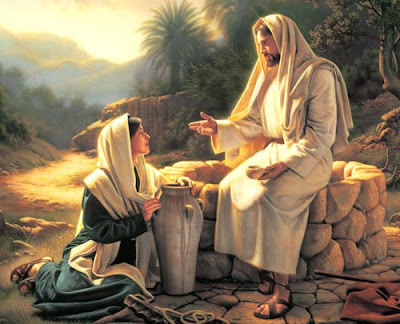 Master Jesus: Dear Miriam, the spirit is not man, the spirit is not woman. Tell me, where is your family? Miriam: My family is in the synagogue, in the mount Gerizim... I’m sure that your relatives are in Jerusalem. Master Jesus: Dear Miriam, yes, many of my relatives are in Jerusalem and they went to the synagogue obeying the Law, but you know that you are spirit and you know that the Father is Spirit... It’s not necessary that you go to Gerizim or Jerusalem... Seek within yourself, there you will find the Father... How old are you my child? Master Jesus: And why do I see so much pain in your eyes? Miriam: Master, I want to talk to you for one second. Master Jesus: You know my child, I have told you more than once, eating by the light of a bonfire, at midnight while the others were sleeping, when we were speaking about the Kingdom that in the measure that we learned, in the same proportion that we knew what the path is, we will vibrate with more Light and that will contaminate to the whole Heaven and that Heaven will expand because of our growth. I don’t know if you can understand what I am telling you. As I also know that if we get happiness in the personal thing we will also be happy. John Zebedee: Master, you are telling me as if you... It is like you are dazzled by Miriam! She is one year older than me! You are 34 years old and she is 18! John Zebedee: Master, she is engaged! Master Jesus: I know that, I won't do anything to break that commitment... Come Miriam, let’s continue with our path. Master Jesus: It can be, but not from other lives but from other planes... We are spirits and you vibrate in the same syntony I do. Master Jesus: No, what one feels in a genuine way, it can never offend. One sometimes would like to get rid of everything and be happy... We have a bag with coins, I could stop walking and buy three horses and if I allowed myself to be guided by my impulse I have enough money to give to your family. And I know because I know it that your family is so needy that they would break up your commitment immediately with that Jacobi and we would leave to the East the three of us in horses to begin a new life. John Zebedee: Master! What are you talking about? Master Jesus: My child, you know that within some stations I will no longer be with you... Now don't say anything, it is not the moment, but I would have sacrificed that end because after all I know that they will distort much of what I say, but I want, in what I have left of this incarnation, to continue giving ideas, to continue giving concepts. And my concept is not to betray, and I don't want to sow my happiness at the expense of somebody’s unhappiness. Master Jesus: No, don't tell me anything. I am talking about your spirit that is immaculate, the rest is transitory. The human being only thinks that the being is the body. Master Jesus: Of course, I hate hypocrites, I tell them race of vipers, and I won't be one to them... I love your gaze, I love your figure, I love all of you... Feeling you, hugging you, would make me the happiest being in the world and that happiness would spread to the Heaven so that this grows. And sometimes even me, with all the wisdom that I believe I have, I don't understand how in so little time I can love so much. You are not only in my same vibration as for my soul, but you are also in my same vibration as for your body. That is the difference with my disciple. I love you impersonally and personally, in both ways. I want to hug you, but I’m not going to do it, because I know that if I hug you I could not back away, because I would feel your person inside of me and I could no longer detach myself from that feeling. Miriam: Jacobi doesn't matter... I don’t want that you dim your Light! My Father says, for what I listen very inside of me, not with words, it is something that I cannot explain, Love is the most wonderful thing that my children can experience and Love is Him, and starting from Him, everything, but thinking that Love has a single branch is impoverish it. They are very few pieces that fit, but those that fit, happy of them!... I know that we with our happiness can make grow Heaven and I know that personal Love is part of that happiness. Anyway, look at my face. What do you see? John Zebedee: Oh! Yes, yes. Master Jesus: This is between us, at least for the time being. Good-bye Miriam...In the physical plane we won't see each other again, not in this world. Yes, we will see each other in the other one... You will surely meet my disciple. It is a tremendous willpower a relinquishment. But I’m going to do one thing, because in the physical plane there is also a vibration... My child takes the hand of Miriam, Miriam take the hand of John. What do you feel? There is a vibration, a tickling between you; you will also feel it in the future... Not for anything especial, Miriam you are here and now. John, you are here and now. But in other lives the vibration will persist, not you... May the Light be with you Miriam... Until the eternity. Note: The Master's prediction was fulfilled because the professor Jorge Olguin (John Zebedee) met in this life with this spirit, also incarnated as a woman. It is necessary to remember that, obviously from the viewpoint of the spirit, there is no relationship with the human couple, the Master Jesus, John Zebedee, Jiddu Krishnamurti and Miriam are twin souls. This entry was posted at Friday, August 07, 2009 and is filed under Biblical mysteries . You can follow any responses to this entry through the .